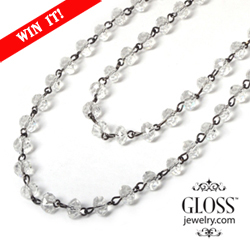 As part of our continuing 7th Birthday Celebration, we are happy to be partnering with GlossJewelry.com to give away this Crystal Daze 32″ Clear Crystal Necklace. Wear it long or layered, it will match your dressy and your casual outfits. I have one just like it and I love the way that it subtly picks up the colors of whatever I am wearing to look like a different necklace every time. We have been continuously impressed with everything that we have ordered from Gloss Jewelry from earrings to chains to baubles. In fact, I get compliments every time I wear them. And the prices are really terrific. On top of their already good prices we always have Gloss Jewelry coupons on Sunshine Rewards. Through the end of February you can take 25% off plus get free shipping with code LOVE25. And now onto the contest! Using the Rafflecopter entry form below you can get various entries for completing different tasks. Entries close at midnight Eastern on February 1. That it can worn many different ways such as formal or casual. I’m not familiar with them but will be checking out the site. I need to update my jewelry selections! I love the affordable options shown. Cannot wait to get shopping. I like the fact that they have very affordable choices. The website is not overwhelming and very easy to navigate and find things of interest. I had no idea Gloss Jewelry existed. I checked out the website and they’re jewelry is so pretty and amazingly affordable! With such a wide variety of choices, they’d make good gifts too. Wow, I sound like a commercial – but it’s honestly true! I love some of the charms. Easy to wear since I already own a chain. And it is nice to have a site that is not over-stuffed with choices. A few very nicely made items and so easy to browse. I like how the jewelry is affordable at Gloss Jewelry, especially with the huge selection they have! Great prices and pretty jewelry. I love how unique their pieces are. I like that their jewelry is different from other sites that you see. I really like the carriers and the charms! I like the fact they look great and are at awesome prices! Very pretty! Can be worn for any occasion. This so lovely. Hope I win. They look high quality without the high end prices. Pretty jewelry for a great price. I like alot of their earrings. I know my daughter would too!!!! Thanks for sharing! I love that they have so many cute options for great prices!! Love the C’est La Vie Charm. I love the charm collection. Great prices too! I’m almost sorry I looked at the site. I want A LOT! They have very pretty items. Beautiful pieces and inexpensive!! Love that combination!